Maybe I will find something wonderfully English to bring home. A little history about Limoges. 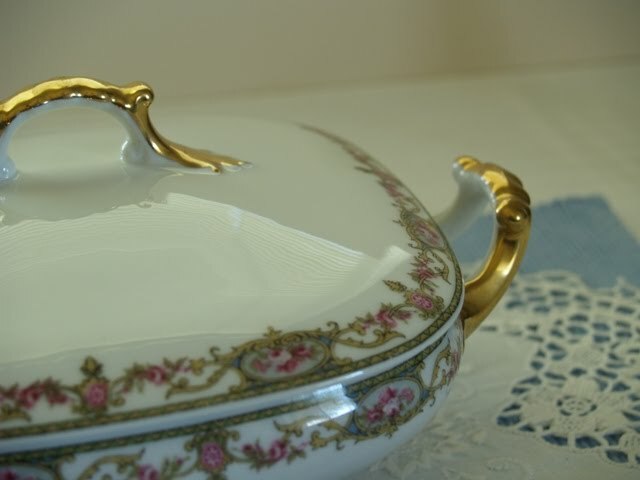 It is a porcelain that was actually produced by a number of factories in the Limoges region of France from the late 1700's until around 1930. 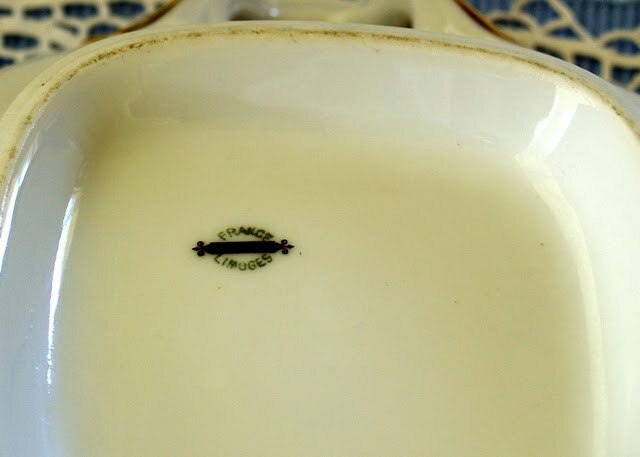 At one point in the 1920's as many as 48 companies were producing ware marked Limoges. 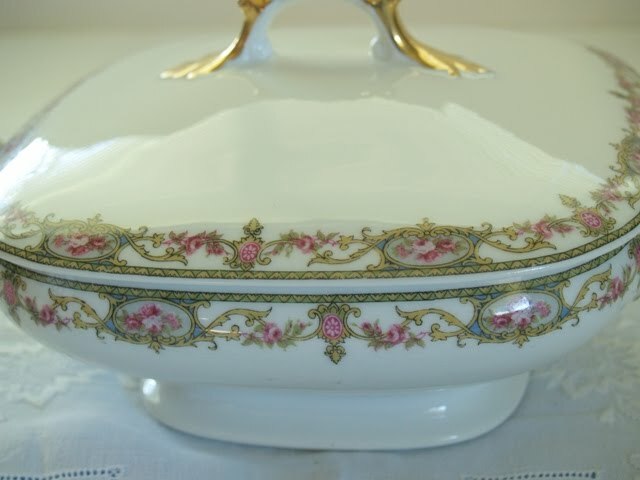 I wanted to share the only piece of Limoges, France I have. 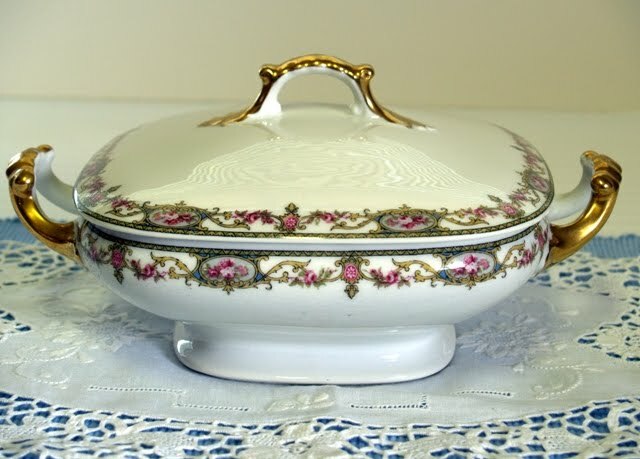 I was at an estate sale and I saw this elegant vintage china tureen and when I turned it over it had stamped on the bottom YES!!!! I bought it for $10.00 dollars. I don't know if it was a good price or not but, I loved it. The unique shape, patina and detailing are so beautiful. It is center stage in the cabinet with my tea cups, saucers and tea pots. I don't know if this piece is decorated with a transfer or hand painted. Some transfers were decals of sorts that mimicked hand decorating. They were often combined with techniques executed by hand. I am not an expert. I just love this piece. 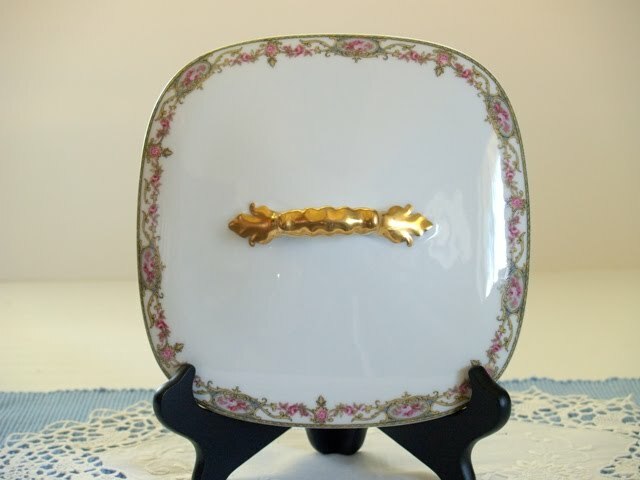 My one and only piece of Limoges China. Thank you so much for stopping by. Please leave a comment. If you know anything about this piece I would love to have you share with me. and where is the decorated marks over the Glaze, ? Why I know a lot of Limoges? Thanks for your comments as I enjoy reading them. I'm a wife, mother, sister and friend. I have been married over 50 years. We have three children and six granddaughters and they have blessed our life. I love homemaking, traveling, blogging and gardening. Tea time is a wonderful part of my day and I hope you enjoy your visit ♥. IT'S GREEN IN THE SPRING!